Behind ecommerce’s social and omnichannel evolution lie APIs, whether they be internal or 3rd party. Powering apps, widgets, sharing tools and content feeds, APIs enable systems to communicate with other systems, and empower you to expand your catalog and content experiences beyond a storefront. For us non-techies, understanding the opportunity for using and monetizing APIs (application programming interfaces) can be best explained by real-world examples. 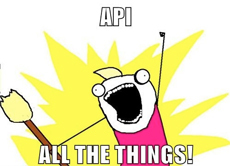 Today’s post is based on a section of slides from a presentation Open APIs: What’s Hot, What’s Not? by John Musser of ProgrammableWeb. 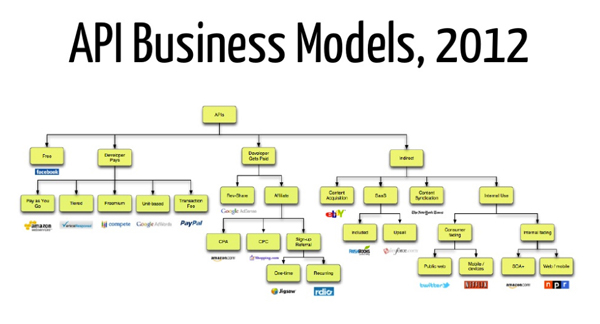 We’ve fleshed out the examples to provide context for each model. Facebook offers its API free to any developer. However, the model is freemium — like Apple and Google, it takes a cut of in-app payments, e.g. the purchase of Farmville Coins. Facebook charges a 30% service fee, plus any applicable sales tax or VAT, on each Facebook Payments transaction. Amazon Web Services is a cloud computing product, its appeal is its efficiency – pay only for what you need to use. It can scale up or down as needed. Developers can use the email marketing tool’s API to create a customized UI or reporting dashboard, for example. Pricing depends on the usage tier you fall in (how many database calls you make in a month). Compete offers a free and paid “all access” version of its data, similar to free anti-virus software and a premium edition. Power-PPC managers may desire beefed-up functionality, such as auto-generated keywords, ad text, and destination URLs. Google Adwords prices its API access a bit like CPM – developers are billed $0.25 per 1000 API calls. For ecommerce sites that want to use PayPal transaction processing without exposing customers to the PayPal interface, the Direct Payment API allows developers to design and host their own checkout pages while the payment processor works behind the scenes. PayPal makes money off the transaction fees. Google AdSense Host API enables community sites to share AdSense revenue with its users to incentivize content creation. Think YouTube channels. There are a few affiliate models. 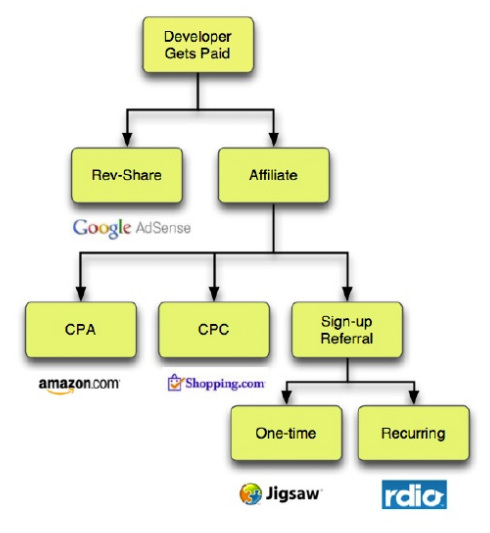 Publishers who advertise Amazon products on their websites can earn commissions when referred visitors make a purchase. Shopping.com ads pay out per click. Rdio is a recurring-revenue product, sharing the recurring spoils (subscription and mp3 downloads) with its affiliate partners through LinkShare. You can earn recurring revenue each month, for as long as a subscriber recruited by you remains an Rdio subscriber. You can also earn revenue each time someone purchases and downloads an MP3. Jigsaw offers a unique way for developers to earn “Jigsaw points” by affirming or challenging the accuracy of Jigsaw data (helping Jigsaw improve its data quality). Ebay’s APIs support sellers with content population (e.g. create listings, upload data feeds) and management (leave feedback, update tracking information, manage disputes) which indirectly results in revenue. Software vendors offer APIs for 3rd party developers to extend their platform. This helps the software vendor focus on the core product without complicating their road map with features not everyone needs. Extensions can be developed to enhance the product, make it more attractive to users who can add the apps they want, and save internal resources. Some software companies have a marketplace where apps can be discovered and downloaded. 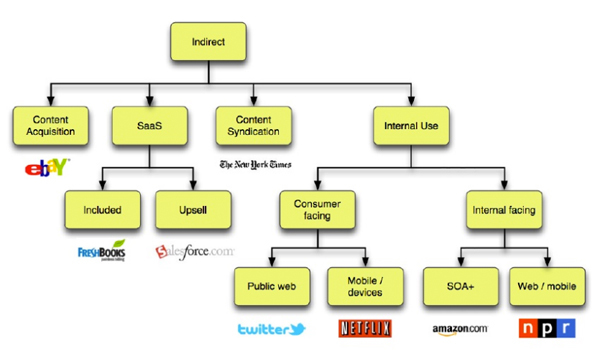 Content publishers like the New York Times don’t sell their API to syndication partners, but the API facilitates the syndication. Twitter’s API is offered to 3rd party developers to improve the user experience with a broad range of Twitter experiences like Klout, Hootsuite, Clicktotweet and Twitalyzer. Netflix’ API enables it to be extended to mobile devices, increasing the attractiveness of the service. Internal facing APIs are used on your back end to use your own data to build out your own features. Ecommerce APIs, for example, may be used to build a companion mobile app or connect social data to your ecommerce platform. NPR offers external API access to its radio programs that can be connected with its Transcript API, which it could also leverage internally, for example. Why are APIs useful for ecommerce?